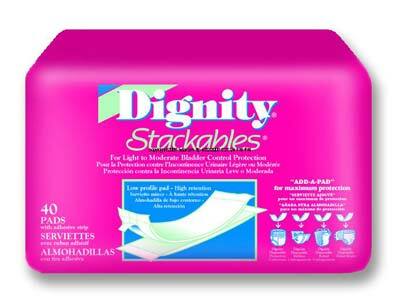 Overview - Can be used with Sir Dignity® and Lady Dignity® Pant and Pad System. Thin, barrier-free pad with adhesive tape strip. Super absorbent polymer for dryness and odor control. Optimum fluid retention under pressure. Layer multiple pads for extra protection. Can be used as a booster to enhance absorbency of other products. Featherweight pads can be layered to meet individual needs. 45 pads per package, 180 pads per case. These work well. However for my needs, I leak anyway. If you have mild incontenence then they work fine. This product is not exactly what I needed to solve the problem of leaking during the night along with the nighttime pull-up with maximum capacity due to the fact that my husband sleeps on his side for the most part. It seems to add too much bulk. The product worked great. We use these at night with my special needs grandson and they help keep him dry and also help keep his bed clothes dry.